In another effort to explore my creative side, I made a collage. 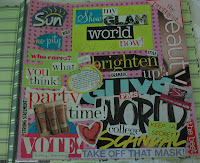 Collages are great for self expression and they are fun to make. Mine is quite simple, but it did require a good bit of work. All you need is a magazine, scissors, paper, and glue. My collage represents me and what goes on in my life. Have fun making your very own piece of art!